I keep buying flight sims, but yet I'm no pilot. Luckily for me, most flight sims have options to turn down the realism, otherwise I'd be pizza every few minutes. I did like this game quite a bit. Mostly because it had LAN play. At the time, my friend Aaron and I would spend hours just dog fighting. If I recall correctly, I got into this game mostly becuase of his interest in it. Too bad, we don't find to dogfight anymore. Maybe a catfight is in order. One thing that disapointed me about this game was the lack of hardware acceleration. At the time of this games release they did not exist, but a year or so afterwords, I got my first 3dfx card. 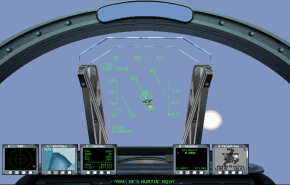 At that time, I thought it'd be so great to have a flight sim to play on it. Took a year or so after that for Falcon 4.0 to come out. This game lets you fly just about every modern plane in existance. It's a great collection.